A number of government health centers suffer from low-quality health services, a poor supply of medicine, unqualified health staff and a lack of basic equipment. Consequently, government health centers are often unable to provide the health services listed in the directory of the Ministry of Public Health and Population (MoPHP).. The SFD, in collaboration with the German Agency for International Cooperation (GIZ), responded to this challenge by beginning to expand the Health Quality Program in Hadhramaut Governorate. The program targets five health centers in the coastal districts of Hadhramaut, in coordination with the MoPHP, the Yemeni-German Reproductive Health Program (YG-RHP), and the Office of Health in Al-Mukalla. The SFD program aims to improve the quality of primary healthcare services at these facilities by providing on-the-job training to health workers in the targeted facilities, providing equipment to the facilities, and promoting health services in the community. One of the beneficiaries of the program is the Director of November 30 Health Center in Al-Dees District (Al-Mukalla City), Mr. Awadh Al-Ammari. Mr. Al-Ammari explained that the Center’s services covered 18,000 people, and that prior to the SFD intervention in June 2010, the average number of visitors was stable at 40 people. Eight months after the intervention, the number of visitors had doubled to 80, with the number reaching 250 by November 2011. "In addition, some visitors from out of the district come to receive treatment," added Al-Ammari, "and the center presents new services such as health education and means of reproductive health and maternal and child health services and promotion activities for the center services." 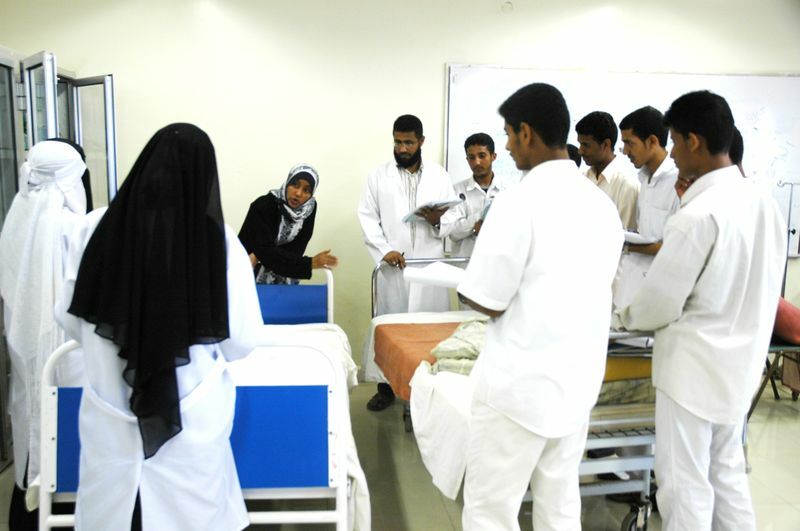 In the Rawkab Health Center in Al-Mukalla City, an administrative staff member explained how the information system introduced to the center has supported the administrative staff there, helping them to identify the medicines, vaccines and tools needed for the center during a specified period, according to visitors’ needs. She also noted that the staff holds periodical meetings to discuss the center’s problems, and to follow up with the Office of Health or the local council for assistance in solving them. The center's Director, Omar Saleh Bamansour, added that the center’s work and organization has reached 80% of its target so far, and that the staff members had become capable of planning and implementing their activities systematically and satisfactorily. A final benefit of the center is that they have been able to understand the health issues of the local people. The center has also improved its recordkeeping for visitors in order to have better information for follow up visits. Economic and social empowerment is believing in people’s potential when no one else would! &COPY; Copyright SFD 2019. All rights reserved.